I’m always surprised by how quickly the seasons turn, and how rapidly I adjust. By nature I am resistant to change, growing anxious in anticipation of a shift and preemptively mourning what is about to pass. The end of summer is especially bittersweet. 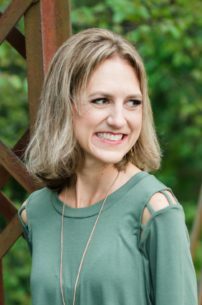 But each year when September arrives, we settle into the rhythms of a new school year, and I’m reminded of my love for autumn and all this season has to offer. This month has been unseasonably cool and my moods have reflected the gray skies, but I’ve found comfort in familiar routines and quotidian moments. 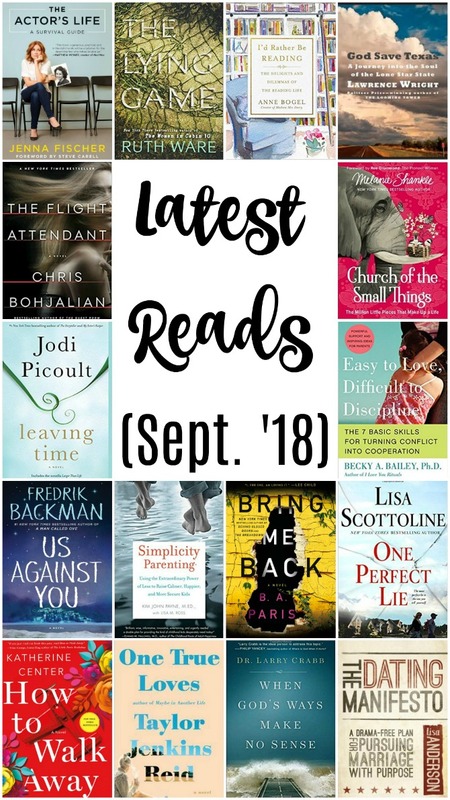 There has been much to love about this September. I read a handful of solid novels this month; no runaway favorites, but plenty to recommend. Fredrik Backman’s latest wins my vote for most beautifully written, while this book from Jodi Picoult will likely stick with me the longest. I also read quite a few unique yet delightful nonfiction books. I adored Anne Bogel’s collection of essays on the reading life, and was equal parts entertained and inspired by this book from Melanie Shankle. At the start of the year I set a loose goal to read 75 books in 2018. I quickly blew past that number and now, as we approach October, I’m hovering under 170 books so far this year. With the 200-book mark within reach, I’m setting it as my new unofficial goal. A few things have been helping me to boost my reading time. The first is that I’ve fallen back in love with print books. When Charleston was born, I began reading ebooks almost exclusively because of the convenience factor. I’m still doing most of my reading that way, but lately I have been checking out hardcover duplicates from the library whenever I can; I read the physical book at home when it’s convenient, and switch over to Kindle when I’m reading at the gym or for bedtime reading (so that I don’t have to turn on the light and wake up my boys as they sleep). Having multiple ways to read the same book increases my likelihood to choose reading over other downtime activities. And having the Kindle backup of my hardcover makes it possible to switch over at any time to make highlights and notations (which I can’t do in a library book). I like to simultaneously check out Kindle versions of the audiobooks I’m listening to for the same reasons. 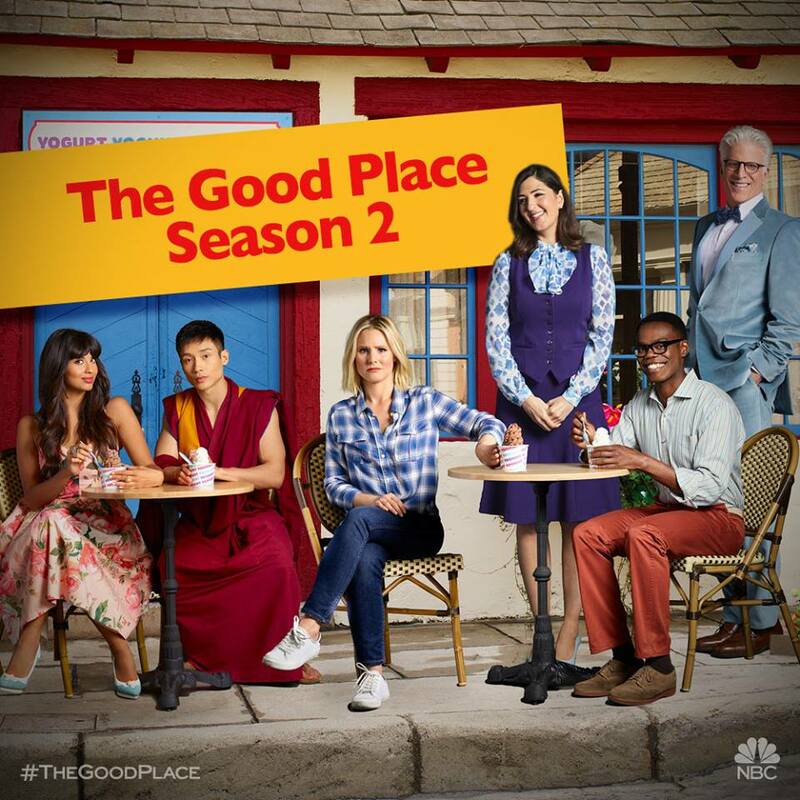 The Good Place, Season 2: Luke and I loved the first season The Good Place, a show about a woman who has died and finds she’s “accidentally” been sent to The Good Place despite having been a terrible person on earth. The Season One finale included a big twist, and Luke and I couldn’t wait to see what happened; we began watching Season Two the day it came to Netflix. I won’t give anything away for those who haven’t seen the first season, but this season is very different. It’s darker, but still quite funny. Some portions got a bit tedious (if you’ve watched, you’ll know what I’m talking about), but I loved the philosophical discussions and watching the characters develop. I wish the season had been longer (it’s only 12 episodes), but it ended on an intriguing note and I’m eager to see how the plot develops in Season Three. An added bonus is that I have several friends who watch this show, so it’s been fun to discuss it with them; usually I’m so far behind on TV shows that people have forgotten all about them by the time we get around to watching. My Rating: 4 stars. People love Trader Joe’s, and while I don’t shop there regularly (it’s just too far from us), I’m a from-a-distance fan of their products and business model and was excited to check out their new podcast. The show released its first five-part series last spring with episodes dishing behind-the-scenes secrets on everything from popular products to company values. The show takes a newsroom-style format, which isn’t usually something I’m drawn to, but I enjoyed hearing how specific products came into being, which items are most popular (Mandarin Orange Chicken is their all-time top seller), the reasons some products get discontinued, and what it’s like to work for Trader Joe’s. I was particularly impressed with all that goes into maintaining the integrity of the Trader Joe’s brand. The podcast just launched Season Two, and I’m looking forward to hearing more. I think I’ve mentioned here before that I’ve been engaging in a months-long search for the perfect snack bars for Charleston. The right bar needed to meet three requirements: 1) a short list of wholesome ingredients; 2) not messy (neither crumbly nor containing melty chocolate); and 3) Charleston-tastebud-approved. 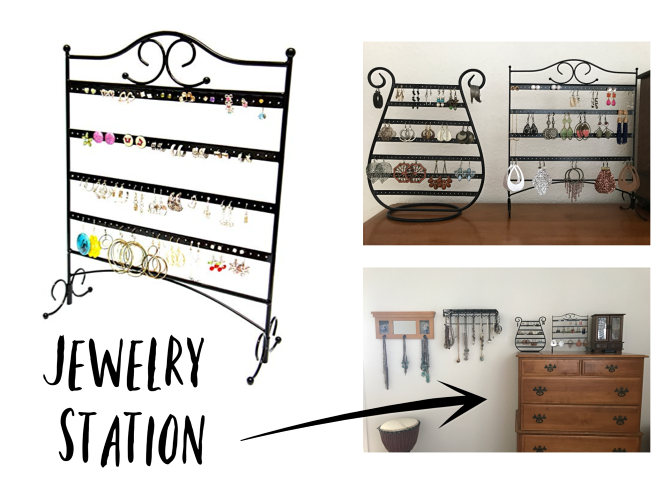 I’m happy to report that we’ve finally found our Holy Grail! Though they aren’t marketed as a kid food, it’s a food that MY kid likes and that’s what matters! 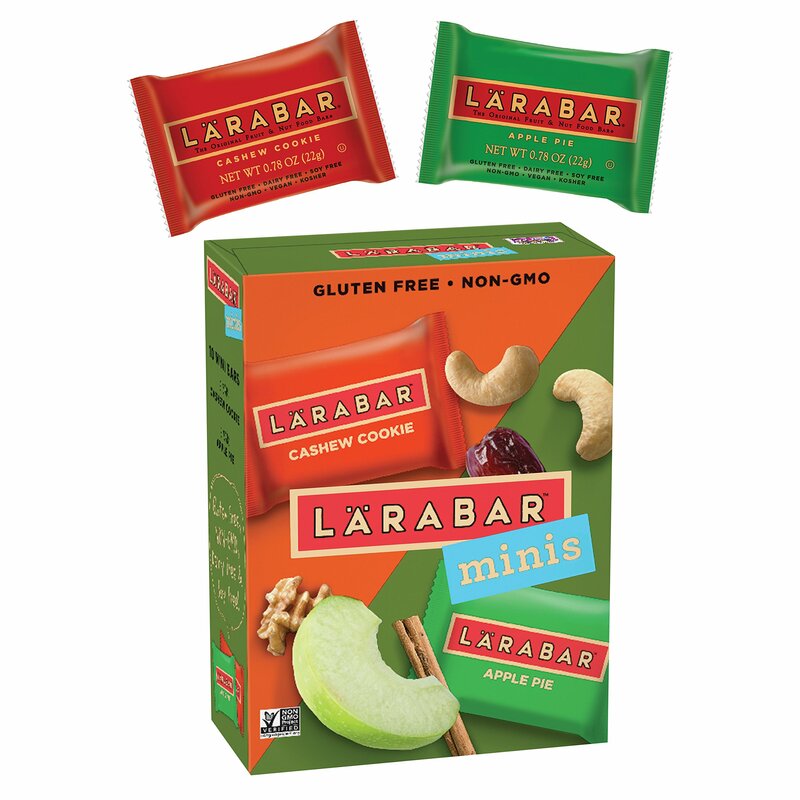 We had sampled Lärabars in the past but I guess we just hadn’t found the right flavor. After a little more experimentation, we discovered that Charleston really likes the Apple Pie and Cashew Cookie bars, which is awesome because these are two of the healthiest varieties (the only ingredients are nuts, fruit, and cinnamon). I’ve been buying a variety pack of the mini bars, which are just the right size for an on-the-go snack—one that does not melt in my car! Dark Sky is my default weather app, and I recently discovered the Time Hop feature! I have no idea if this is new, or if it’s just new-to-me, but it’s awesome. 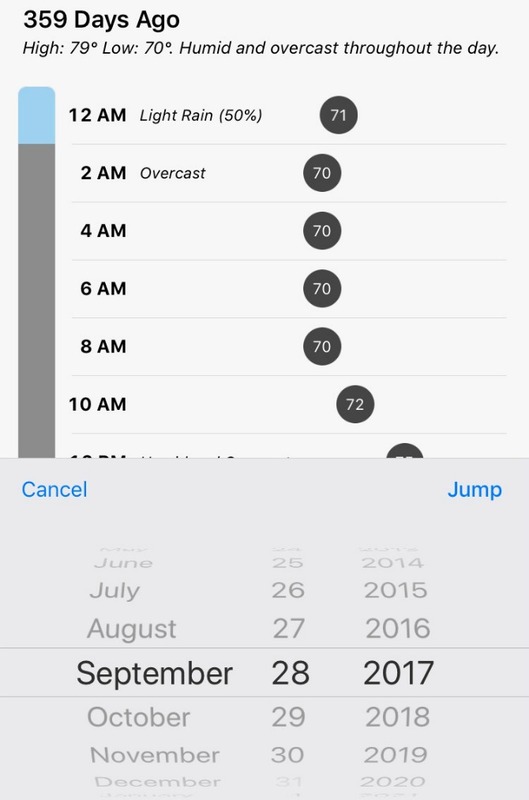 You can set any date from the past and look at the exact weather stats from that day. Below is a screenshot of the weather from my home, one year ago today. I’ve been having way too much fun playing around with this, seeing how each day’s weather compares to that of past years. You can also look at predicted weather for years into the future; I have no idea how they developed that algorithm, but it intrigues me. To be totally candid, this month has seen more parenting lows than highs. But just when I’m on the verge of a complete breakdown, Charleston comes through with the funniest quip or the sweetest encouragement. Here are some of my favorites from this month. 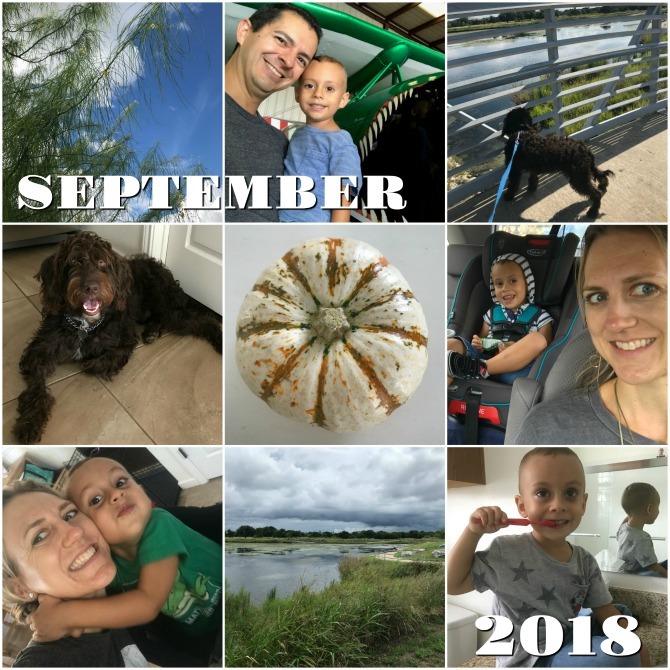 Though this month was very full, our days revolved around routine activities. My MOPS group and Women’s Bible Study both started back up again for the fall semester, I’ve returned to volunteering at church on Sunday mornings, Charleston started a new gymnastics class, and our Community Group is meeting regularly after having a sporadic summer. We’ve also made time for play dates, time at the park (when it hasn’t been raining), and plenty of walks with Arlo. Our one “highlight” event this month was not a particularly happy one, but it was huge for our family and therefore worth documenting. Charleston has been prone to getting styes on his eyes since he was little. In the past they always went away on their own, and he had a year-long stretch without any. But early in the summer he developed one stubborn stye that just wouldn’t go away. He then developed three more, all of which were resistant to treatment. After months of attempting a less aggressive treatment approach with hot compresses, massage, and various ointments, we agreed to his doctor’s recommendation of having the styes surgically removed. Though it was an outpatient procedure, it did require anesthesia which terrified me. 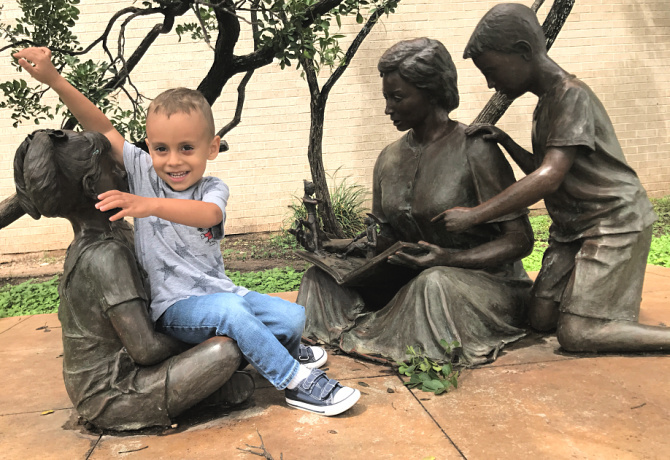 I’ve never had surgery myself, and to see my son undergo his first medical procedure was agonizing. 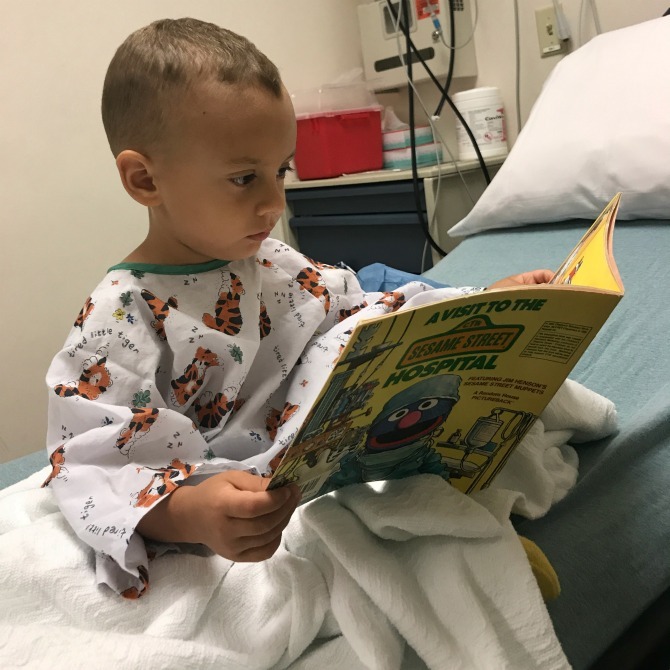 We prepared him by reading this book about hospitals (oddly a favorite of mine from childhood), and with the exception of his reaction to the anesthesia (which was horrific), he did great. I, however, was a mess. I’ll be sharing plenty more about my takeaways from the experience in Monday’s What I Learned post. I’m feeling hopeful that surgery was the right decision. Recovery has been a little rockier than I’d imagined but the styes are gone and if this is what was needed to help Charleston have healthy eyes, it will have been worth the dollars spent and tears shed. Hard to believe that September is almost over! What was a highlight of your month?